What happened in this area in the recent elections to the European Parliament? I don’t wish to recite the numbers, results and facts that are generally known. Is there something else instead that we should notice? Europe must undoubtedly have noticed the score it achieved in terms of participation in these elections. In the Czech Republic it was 82% of eligible voters that neglected to cast a ballot. In this we were overtaken by the state closest to us – Slovakia – which took the prize Europe-wide with 88% non-participation. But other states performed similarly: Poland 77%; Hungary 71% non-participants. Wedged between these two countries were also Slovenia and Croatia. All of the post-communist countries fell below the European average of 43% voter turnout, with only Lithuania slightly above it. Before I set to looking for answers to why things ended up like that, a few words about the region of Central Europe. The four states I mentioned have much in common in their recent history and, as a result of that experience, share very similar social structures. Communist-type parties previously governed, the countries were members of the Comecon and the Warsaw Pact. It is thus possible to expect that the political behaviour of these countries’ citizens will be similar. The lowest voter turnout in the history of Czech Euro-elections was apparently caused by people’s lack of interest in the European Union, accompanied by a lack of understanding of what the EU brings us. Another reason people did not participate in elections to the EP was that they did not understand what the institution does and had little information on the activities that their chosen EP representatives would carry out. Roughly one-half of those who refrained from voting were regular non-voters (who do not participate in the EP or any other elections); another third decided not to participate during the week before or on the day of the election. Certain journalists and political scientists let it be heard that the reason for the lack of participation was opposition to “Europe”, patriotism or a failure to appreciate European democratic traditions. The exact results do not confirm this. The tendency to avoid the election to the EP was slightly higher among people of lower middle age (up to 44 years) and those with lower levels of education (people with basic or apprentice-level education account for 49% of the population and 56% of them did not vote; people with a college education account for 16% of the population and 11% of them did not vote). In terms of professions, nonparticipants more often tended to be blue-collar workers (labourers), or people without work, and those with a centrist political orientation. The most common reaction of people to the result was that non-participation was the manifestation of our citizens’ lack of interest in the EU (for more than three-quarters of people this was an important or fundamental factor). Another three opinions though were given to about the same extent: that people do not have sufficient information about the activities of our Euro MPs, that they do not understand what membership in the EU brings and that they do not know what the European Parliament does. More than a half of people believed that an important or fundamental factor in the low turnout was the media, which was unable to explain the importance of these elections to the people. Two-thirds of the population were of the belief that people “not feeling like Europeans” had little or nothing to do with their not going to the polls. There is however one aspect that the survey did not analyse and that I would like to add. It does not apply only to the European elections. But in its own way it would explain the similar behaviour found in other former socialist countries. It’s about one’s inner relationship to democracy and the specific form that democracy takes in the post-communist era. In the years following that systemic change, formally democratic principles did indeed become a cornerstone of society; in practice though, emphasis was being placed on democratic rituals. Voter turnout/non-turnout is analysed in detail, but it is taken as fact that elections intrinsically resolve the point that “the people are the source of all power, executing it through the legislative, executive and judicial bodies“, as set out in the Czech constitution. It would seem that Czech citizens have a legitimate feeling that there are, at the very least, a few other sources of power that come from elsewhere. After all, none of the fundamental issues that have had a significant impact on Czech society in the long term have ever been the mainstay of an election campaign to the Czech parliament at any time in the post-communist era. These issues were ultimately dealt with by more or less anonymous and non-transparent, often international, ruling elites. To mention a few at random: the speedy integration into the NATO military-political structure, active participation in the Balkan conflict, the bid to install US military bases in Czech territory (i.e. the “radar affair”), the means and execution of state property transfers via coupon privatisation, the so-called reforms to the health care and pension systems, which entailed the de facto privatisation of public property and institutions, restitution of church property on an unprecedented scale and so on. In none of these strategic decisions were “the people” permitted any significant say. While the Czech constitution of 1992 does envisage referenda, for safety’s sake no act of implementation on referenda has ever been passed. And thus, it seems, “the people” have come to understand that their participation in the ritual of European elections is not of much consequence. The politicians make an effort, the budgets are inflated, ad agencies work desperately, money flies everywhere… and the voters just blow it all off. Even professional pundits and analysts have realised that there’s something wrong here. Democracy, as we have conceived it and imposed it upon our citizens, is not supposed to look like this. The citizens are supposed to be delighted! The easiest thing to do would be to get a whole new citizenry, but that’s too technically demanding. To avoid any misunderstanding: this is not the opinion of some fierce leftist but of the conservative and libertarian sociologist and journalist P. Hampl. It must also be said that this opinion is not shared either by the mainstream media or by the so-called renowned political commentators. Those groups persistently defend contemporary democracy as the best it could possibly be. And if there is a mistake somewhere, then it is on the part of the citizenry, which is not “civic-minded”. It is interesting though (as I’ll mention later on) that this absence of voters affected all social segments of the populace equally, which is clear from the election results within the country, which do not essentially differ from parliamentary elections with higher voter turnout. There is nothing to support the thesis that non-participation in European elections equates with a condemnation of Europe, an expression of our being closed off within a national, nationalistic setting. Citizens distinguish between Europe itself and its citizens, and the political-economic structures of Europe. While they identify with the former, many have at least a number of doubts about – or various degrees of objection to – the latter. We are Europeans, but we are not content in the contemporary neoliberal European capitalist system. In a system that boasts of democracy, but makes skilful use of every means of swaying the citizen to its own advantage regardless of demos kratos (people power). The message sent by non-voters -- at least a part of them -- can be read that way, too. And why is this more easily perceptible in the east of the West? Perhaps because citizens of the neglected East see certain aspects more clearly. Just after the fall of communism there emerged a slogan: “Back to Europe”. These countries went over to Europe, but Europe itself was undergoing a transformation. It appears that a large part of the population wanted to be a part of Europe, but didn’t know what it was they were becoming a part of. And the contradiction between the expectation of brighter tomorrows and the rather grey reality reinforced the scepticism and disillusionment of a part of the citizenry. It is important to avoid the easy and erroneous interpretations that are sometimes heard from the left. This is not about a majority becoming disillusioned with capitalism as such, but with contemporary, neoliberal Central European capitalism. Now for the second brush against the surface of politics. How did the European elections actually turn out in Central Europe? This too is a topic about which I do not want to repeat facts and figures in detail, as they are known for the most part. While parliamentary elections do enjoy two to three times greater voter turnout in the countries mentioned (Czech Republic 59.5%, Slovakia 59.1%, Poland 48.9%, Hungary 61.7%), none of those countries saw a result in the European Parliament election that was fundamentally different from their parliamentary election results in terms of the political parties’ spread. What can we deduce from that? Not even lower voter turnout caused any significant qualitative shift in the distribution of political representation. That representation in European Parliament elections “copies” the national level in all countries. From this one can also infer that no relevant political force either gained or lost ground on account of low voter turnout. It’s as if citizens said: we won’t go to the polls, but we’ll keep the basic proportion. What led Czech voters to that choice? ... participating in the election were primarily stable and regular "staunch" voters who are accustomed to taking part in every type of election and consider it an obligation to participate and support their preferred party or candidate, believing that their vote is important in this regard. The reason for voting most frequently given was indeed "to support a preferred party or candidate’"(21%), closely followed by "to influence the future, participate in decision-making’"(19%), "to fulfil a civil duty’"(18%) and the statement that the respondent is a regular voter (14%). Certain other, less-frequent answers can also be put into the same categories, such as "to exercise my right to vote" (3%), "interest in politics, elections and participation in them’"(1%) or "the need to express my opinion and preference’"(1%). Conversely the negative option "to vote against a party or candidate" was an essentially marginal matter (2%) and only a small percentage of the declared rationales was taken up with general or specific dissatisfaction with domestic policy relating to a need for change or protest (5%). Another factor that proved not to be too significant was the specifically European rationales regarding in one way or another the EU itself, which together comprised 9% of the collected responses, the most common of which was "interest in the EU or EP and its importance for the CR" (4%) and the statement that we are EU members and citizens (3%). An entirely marginal reason for taking part in the election was the influence of family and environment (1%). The overall responses indicate that it was primarily the politically active core supporters of individual political parties who took part in the election. One fourth (25%) stated that they voted for the party for which they had the greatest affinity or sympathy, almost the same number (24%) gave as their reason agreement with the platform or convergence of opinion, 14% praised the quality of the party and its individual members or candidates, and a similar portion (14%) of EP election voters asked categorised themselves as committed supporters of the party who vote for it regularly. With regard to the topics that the voters said played an important role in their decision to choose a party, domestic issues took precedence – with more than one third (36%) of voters – over issues associated with the European Union, which in turn had priority for a tenth (9%) of EP election participants, although for the relatively largest, majority portion (53%) both were of equal importance. In the first part of this presentation I spoke about nonparticipation and the reasons for it. It would be interesting to compare the situation in the individual Visegrad countries. I believe though that the differences would not be qualitative. What is different is how the opinions manifest themselves outwardly -- how they are reflected in the political structures arising from civic elections. How the political map looks in the individual countries. That is the third brush of the rock on the water. In the introduction I spoke of how these four states have much in common. Let us look at the composition of the legislative assemblies that arose from parliamentary elections. It would seem that there could not even be more differences. In three of the countries there is no politically relevant entity that could be said to represent the radical left. In two of them (Slovakia, Hungary) there are parties that belong to the Party of the European Left (EL), but these are (with all due respect) marginal parties. In Poland there isn’t even any party that approximates the EL. Alongside all this is Communist Party of Bohemia and Moravia (KSČM), an EL observer, with its consistent election results between 11 and 15%. How is it possible? The answer to that would require a seminar in itself and even then there is no guarantee that we would reach any shared fundamental conclusions. So allow me to merely point to a couple of those small waves I mentioned earlier. But we have to go back a quarter of a century. In all of these countries there were communist state parties (with various names). In each country there was massive membership in these parties (e.g. the KSČ – Communist Party of Czechoslovakia as a whole: 1,700,000 members, with around 1.2 million members on the Czech side and half a million in Slovakia). The political changes in 1989 confronted the communist parties and their members with an existential question – where do we go from here? Whereas Poland and Hungary “set things in motion” in at least the second half of the 1980s, in Czechoslovakia – in the joint state of Czechs and Slovaks – there were no such visible changes. Even Mikhail Gorbachev’s perestroika received a much more ambiguous reception here. On the other hand, the socio-economic situation of the citizens of Czechoslovakia was better and more stable than in Poland and Hungary. In each of these countries the parties and their members sought to set their own course. In each of the countries they went through a greater or lesser transformation. That transformation consisted of denying their own governing parties certain principles such as a “leadership role” in society, the absolute dominance of party ideology, a monopoly of the cadre. It was also about seeking stance vis-à-vis their own history. In the Czech Republic and Slovakia this also came to include the handling of the relationship to the 1968 Prague Spring and the half-million KSČ members who had to leave the party in the early days of so-called normalisation. The wave of change and the end of the Soviet hegemony at the turn of the 1990s had three fundamental consequences in the Central Europe region: re-orientation towards the West, the transfer from a command economy to market capitalism and the transformation of the system of one-party government into one of free political competition. These constants constituted a basic political “post-communist” consensus, both within the democratic political forces and within the scope of public opinion (see D. Kunštát, Behind of Red Curtain, Institute of Sociology, Academy of Science CR, Praha, 2013 – the following facts are taken from there). In Poland and Hungary the post-communist parties accepted the policies of their reform wings. They transformed themselves into “catch-all parties” closer to the social-democratic parties of Western Europe. At the same time, individual bodies of opinion splintered off. Some of these survive to today, but their political impact is quite marginal. Transformed parties came to power in the 1990s as social-democratic or "socialist" parties. They both got themselves into crises and are now in the opposition. It is generally true that the successful transformation of the Czech Communist Party – i.e. cleansing it of its communist [Stalinist] burden, in the understanding of the political mainstream – means its social-democratisation and reformation, practically reducing its membership base. The process was similar in Slovakia as well. The original Communist Party gave rise to the post-communist Party of Democratic Left (SDL), which also shared power in the 1990s. A crisis followed, however, as is traditional for the “reformed” communist parties of the post-Soviet bloc, as did a loss of political positions and voter confidence. Its core moved on to the newly emerging SMER party, which now declares itself to be a “pure” social-democratic party. With that, the restructuring of the original Communist Party was complete. In addition to this movement there also existed other post-communist formations, the most distinct of which today would seem to be the Communist Party of Slovakia (KSS), which nonetheless only has the support of around 1%. It is a member party of the EL, although it has been practically inactive there of late. This does not mean though that there are no voters for the radical left in Slovakia, but SMER has integrated all leftist elements into itself, including those voters. It remains to be seen how long this system can work, dependent as it is on its charismatic leader. In the most recent parliamentary elections (2012) SMER received 44.4% of the vote while KSS won 0.7%. The presidential election in the spring of this year though saw the SMER chairperson and the government defeated; while in the European elections SMER received 24.1%, KSS 1.5% and another radical left-wing group 0.5%. It would seem that the moderate left in Slovakia has reached a boundary that they cannot overcome, and that the pendulum is starting to swing back to the right. What will become of the Slovak radical left when that happens is an open question. 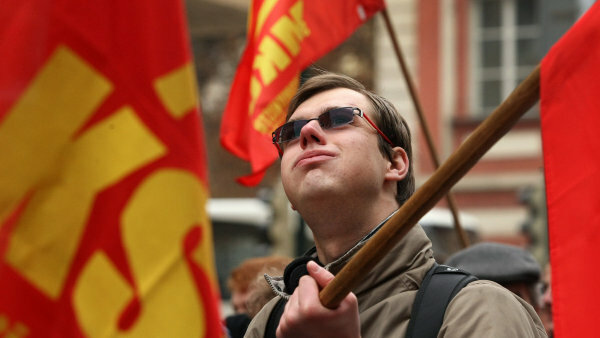 The Communist Party of Bohemia and Moravia (KSČM) is a rarity in Central Europe. In none of the other post-communist countries does a communist and little-transformed party play an analogous role in the party system. In none of them does such a party enjoy such large and stable voter support. The KSČM never lost the position of a significant and fully relevant political force, or the potential that allows it to put pressure on other parliamentary parties. How did this “miracle” come about? Through a number of factors. It is certainly not true what some pundits from the anti-communist camp say, that communists continue to constitute a danger to the state and society. This line of argumentation states that we see here the manifestation of “friends of the old communist systems” who are only interested in regaining their power. A far more precise point of view is this: that in its 25-year development, the KSČM has gone through several phases. In the first period it looked for a new path towards the future. There were partial reforms and adaptations to new conditions. The membership base changed too, with part of the original members, including several members of parliament, leaving and creating new entities. Many of these later vanished, with only the tiny Party of Democratic Socialism (SDS) – an EL member party – operating long term. Czech communists and their party have been under the pressure of the anti-communist segment of Czech society and the new political elites since the outset of the 1990s. V. Handl characterised the historical development of the KSČM and its transformation as a process “from a strategy of left-wing withdrawal to unwilling Europeanisation”. Like a journey starting in a ghetto and prevailing over an orthodox communist course, through a period of stabilisation to the position of sought-after political partner – though often with aversion on the part of its partners. I would say that it was thanks to the Communist Party’s only partial reformation and its being under heavy anti-communist pressure from outside that it was able to maintain its political position and unity with relative success. The “centrist” policy that the KSČM leadership has undertaken – perhaps more intuitively than deliberately – has proven to be successful in the long term. We must also be aware of the fact that the post-communist arrangement in the Czech Republic could not have been a foundation for the formation of social democracy. Czech Social Democracy (ČSSD) operated in exile from 1948 and at the beginning of the 1990s it once again began operating at home and gradually building up its organisational and core structure until its victory in parliamentary elections (1998). Since the mid-1990s the Czech left thus hosts a stable structure of moderate and radical leftists represented in practice by the ČSSD and the KSČM. There are of course in Czech society radical leftist forces of a non-communist (and sometimes even anti-communist) nature. Never have they put together a political force of any consequence, however. Their significant representatives are in left-wing groups emerging ad hoc within the scope of NGOs etc., or are occasionally offered candidacies in one of the centre-left entities (closer for example to the Green Party, SPOZ etc.). On the other end of the spectrum is the KSČ-ČSSP (Communist Party of Czechoslovakia – Czechoslovak Party of Labour) formation that claims continuity with the former pre-revolution Communist Party of Czechoslovakia (KSČ) and avows the principles of Marxism-Leninism. In the European elections they received 0.56% of the vote. The constituency of communist candidates is neither the exclusive nor majority recipient of the votes of “former communists”, as certain commentators are fond of saying (for example in 2010 the majority of pre-revolution communists supported political entities other than the KSČM, the majority probably backing social democrats). The majority of the party’s current electorate has nothing to do with the previous Communist Party of Czechoslovakia (KSČ). The KSČM constituency is older – 58.6 years on average (2010), 44.3 for other parties. However, it is civically active – 40% of KSČM voters are involved in various organisations (interest groups, sports, fire brigades, trade unions etc.). One third of the voters are even unwilling to accept the return of “communism” or any other personal dictatorship. They look favourably on socialism, followed by communism, and least favourably on capitalism and dictatorship. Democracy on this scale is roughly in the middle. At the same time, many of them do not see socialism (communism) and democracy as mutually exclusive systems. They both simultaneously received positive appraisals. The perception of the KSČM by non-voters is gradually changing. A slight majority of non-communist voters consider the party to be “totalitarian”, but 3/5 of them acknowledge the party has the same rights and obligations as others. There are still 2/5 of non-KSČM voters who hold the opinion that the party should be outlawed, or otherwise restricted in its activities. More than 1/3, however, believe that the KSČM has been transformed into a modern political party, and that it is the only political entity that has not discredited itself and supports a Czech foreign orientation. Half of them consider the KSČM to be a representative of the poor, and 2/5 believe that “communists” respect private business. Why am I talking primarily about Communist Party? Because there are not many others to mention. The other radical leftist forces on the Czech political scene are fragmented and in many ways marginal. They have no significant support even among the part of the public that is left-oriented, partly because they do not present themselves sufficiently and do not offer the citizens a credible vision. On the other hand, there are many left-wing activists doing a great deal of praiseworthy and valuable work “down there” at the communal level, in non-profit organisations, dealing with ecology or social work. Unfortunately these endeavours are not transformed to the higher political levels where they could and should be influencing the processes of decision making. I would be glad if this presentation contributed at least a little to the understanding of what is happening to the east of the West, and if understanding of the differences between individual European regions and their citizens, understanding of the dialectics of the general and the particular, led to a unified and well-conceived left-wing strategy throughout Europe, in the West and in the East.